A short oddity coincidence story for a Sunday which made me smile. This is a letter from Arthur Clancy to the author Arthur Koestler following the publication of his book The Roots of Coincidence. "I was born on the seventh day of the week, seventh day of the month, seventh month of the year, seventh year of the century. 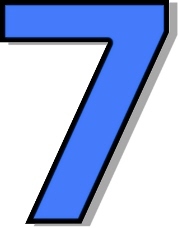 I was the seventh child of a seventh child, and I have seven brothers; that makes seven sevens. On my 27th birthday, at a race meeting, when I looked at the race card to pick a winner in the seventh race, the horse numbered seven was called Seventh Heaven, with a handicap of seven stone. The odds were seven to one. I put seven shillings on the horse. The ending made me smile too! Hope you've been having all of the recent sunshine where you are. Enjoy the rest of the weekend.